Everyone has their own individual style and method for painting figures and this often differs according to the scale and genre of figures you are working on. 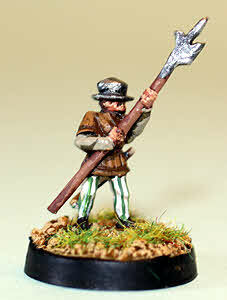 Recently I've been painting large numbers of 15mm fantasy figures and without a system this can take a long time. I thought I'd talk you through the system I use which as I have limited time I've found effective. 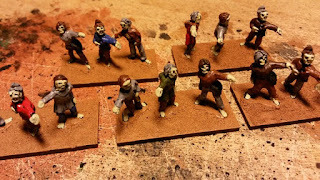 The figures I'll use as my example are zombies from the 15mm.co.uk pack HOT21 Zombie Horde. 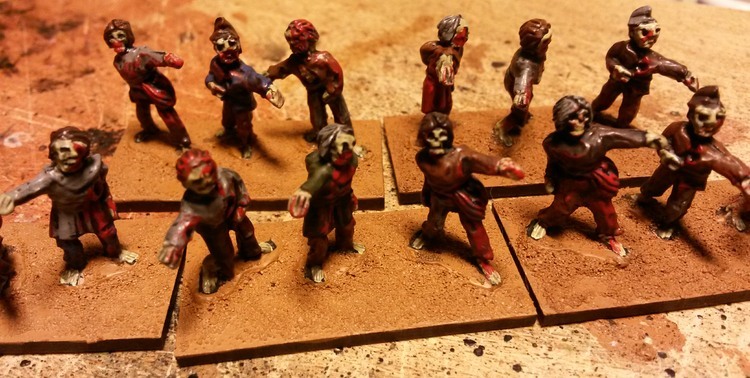 This pack has sixteen mixed unarmed Zombies in it and is excellent value and varied use too. 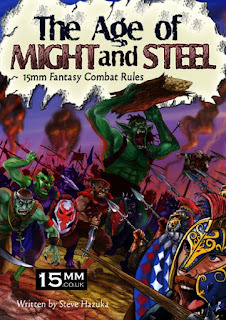 For Age of Might and Steel (AoMaS) you really need zombie units of 10 or 12 stands and each unit has to have a magic user attached. 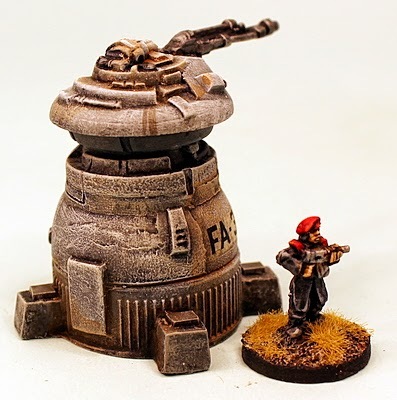 I personally don't like to paint a unit all in one go so I do it in 2 batches of 5 or 6 stands but this is just personal preference. 1. I start by gluing the figures 3 to a 40mm x 20mm stand. There are 4 different poses in this pack and I insure that there are 3 different poses on each stand but in a random order. Once the glue's dry I undercoate the figures in a matt black paint. I like to use acrylic paints as they dry quickly. 2. 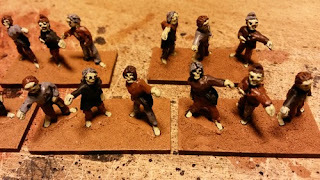 I then add my basing material by adding fine sand to paint of the colour I want the bases to be and put it on. 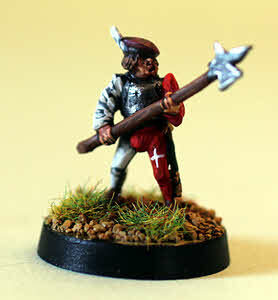 For my current 15mm fantasy armies I'm using a sandy brown as the base colour. 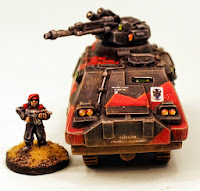 Doing the basing material at this stage is a bit unconventional but I don't like it when I accidently get basing material on a nicely painted figure! I find it easier to just touch up the base itself later on if any paint from the figure gets on it. 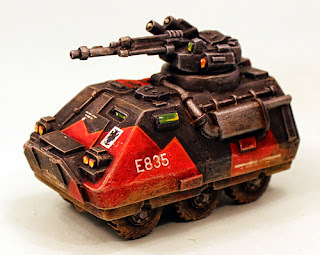 This can all easily be done in an evening leaving a couple of hours between each stage.The basing paint can then be left overnight to dry hard. 3. 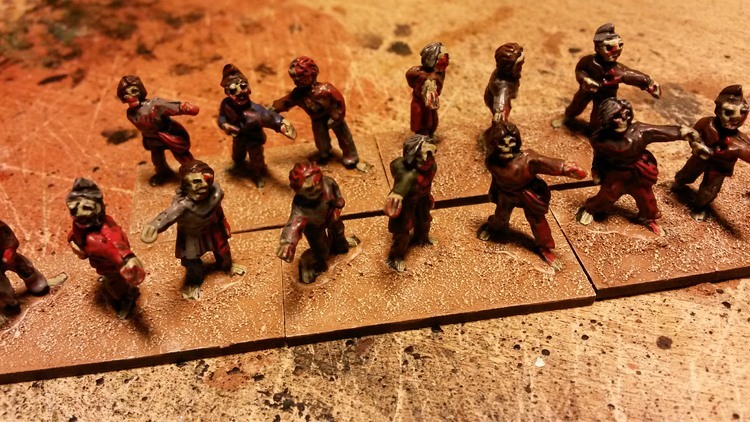 The first paint I usually start with is any metallic areas but as the zombies don't have armour or carry weapons I can skip this stage. 4. 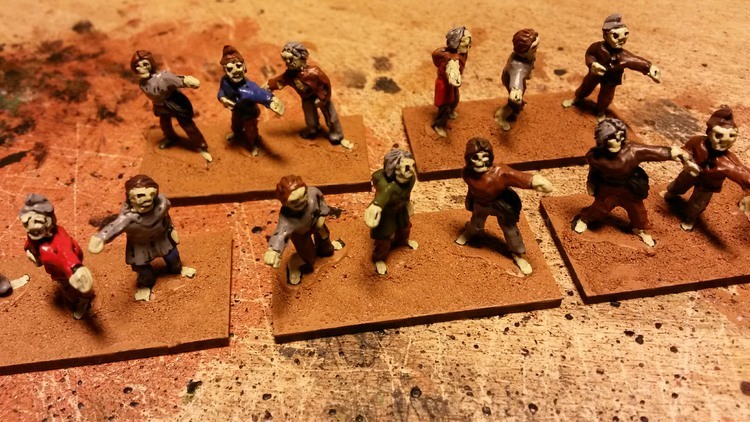 Next I paint any flesh colour which for zombies in 15mm I like to use a sickly pale green. 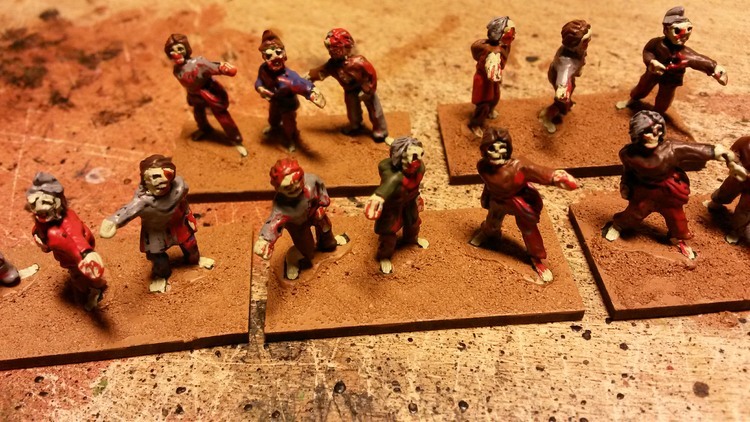 You could also use a light grey or add grey to a flesh tone if you want the zombies to look a bit more fresh! 5. Then it's time for the clothing and hair. 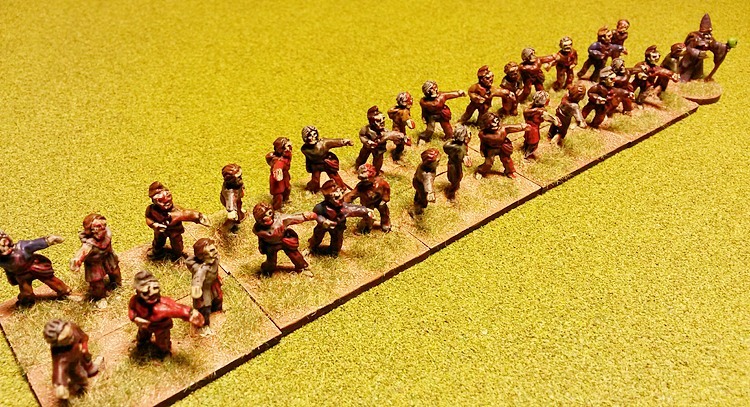 I use 3 drab colours such as a light brown, a dark brown and a grey, randomly across all the figures for the majority of their clothing and their hair as this makes the stands look part of the same unit even though they don't wear a uniform. I then like to pick out the odd clothing item in a brighter colour such as red, blue or green to give a bit of variety but only a maximum of 1 or 2 items per stand so as to not lose the uniformity. 6. By this stage the majority of the figure's surface area is painted and it's time to pick out any details that are unique to a particular casting. 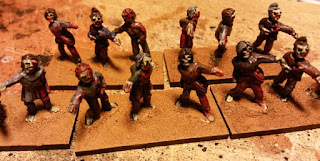 With the zombies one of the figures looks like it has half it's intestines hanging out so a nice dark purple for these catches the eye. 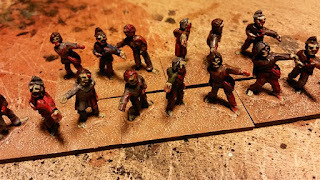 I also add blood around any areas that look like they could have been wounds and on a few figures put blood on hands and around their mouths to hint at previous dark deeds! This adds a further bit of variety between figures. 7. To bring all this together I then cover the whole of each figure in a black ink wash. As it dries it highlights the detail on the castings, it dulls down the colour of the individual paints and also brings colours together by creating areas of shade. 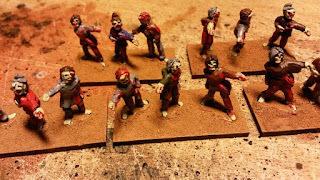 If you're painting figures with nice uniforms you have to be careful not to overdo it so as not to obscure brighter colours but this won't matter with zombies it just makes them look more grubby. 8. 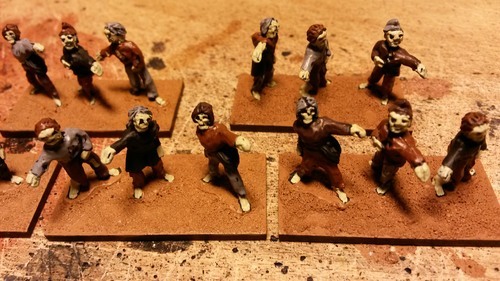 The zombies themselves are complete so its time to touch up the main base colour if required. The fine sand gives a nice texture which can then be highlighted with a lighter colour. I find that a bone colour works well over the sandy brown. I've done the bases in the same style for all of my 15mm fantasy armies as I can then use units as mercenaries or swap monsters to different armies and they immediately fit in visually. 9. 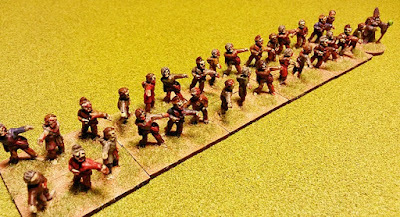 For durability I then give all the stands a coat of varnish to protect them for transport and from damage in the heat of battle such as being battered by dice or being accidently knocked from the table. I use a spray matt varnish so that the figures aren't too shiny but again this is just personal taste. 10. Finally once the varnish has dried I add static grass to the bases using PVA glue as it ties the units in with the green of my terrain tiles, but again this is purely personal taste. The use of different flocks can change the look of any army and can be used to fit them with whatever terrain you require. Including leaving the base paint overnight these 10 steps can be completed within 24 hours and I've done it in the past to have that final unit finished for a particular battle.